The savvy folks over at Good Earth launched their fashion and lifestyle label- Nicobar at a time when the market was flooded with super expensive been-there-worn-that designer clothes, our cupboards were full to bursting with last winter’s Sarojini hauls and we’d absolutely run out of patience scrolling through jazzy shiz on e-comm sites. Phew! Needless to say, the minimalist clothing line with its tropical vibes, breezy silhouettes and affordable price tag was a breath of fresh air that blew our minds! Heralding the onset of summer, Nicobar brought to us a burst of freshness to break the shorts and tee lull that we had resigned ourselves to. Here are our top 10 picks to spruce up your summer wardrobe- high on comfort and effortlessly stylish. An instant favourite, we are totally crushing on this light cotton piece! As summery as it gets, the blouse has a clean, no-fuss look complete with an easygoing feel. We’d team it up with a pair of dhoti pants or structured palazzos, Kolhapuri chappals and a fringed sling bag for a laid-back boho look. With a feminine look courtesy the beautiful Chanderi silk and a cute polka dot patterned weave, you can feel the chilled out vibes emanating from this fluid top from a mile off! Our shut up and take my money moment, right here. If you’re fans of monochrome like us, then this piece will instantly appeal to the fashionista in you. Being true blue jugadu Delhiites, we also love the fact that this top can easily pack two looks and take you from a classy corporate workaholic (add a solid front open blazer, cigarette pants and wedges) to an evening soiree with the gals (time to ditch the blazer). Woot, woot! Hello, summer! Lime and linen-the perfect cocktail to beat the heat! The graceful length and subtle mandarin collar along with the right-sized pockets tailored for your phone, keys and lip balm make this kurta an apt workwear choice as well as an ideal pick for an afterparty. This one just oozes understated elegance. Expensive, yes, but hear us out. This versatile A-line khadi garment doubles up as a dress! While you can pair the kurta version with wardrobe staples like flared palazzos or trousers and ethnic silver accessories, don the dress with a pair of contrast kicks (or white, as seen in the image) and a neon satchel for a night on the town and you’ll have a hard time fending off those admiring (and jealous!) looks. Promise. This one’s for all those ‘I’ve got nothing to wear!’ moments of crisis, we feel you. You can nail that easy breezy summer look in a jiffy with this eye-popping pleated dress (and save yourselves the sun tan too). Just let the dress do the talking. Lazy girl hack. 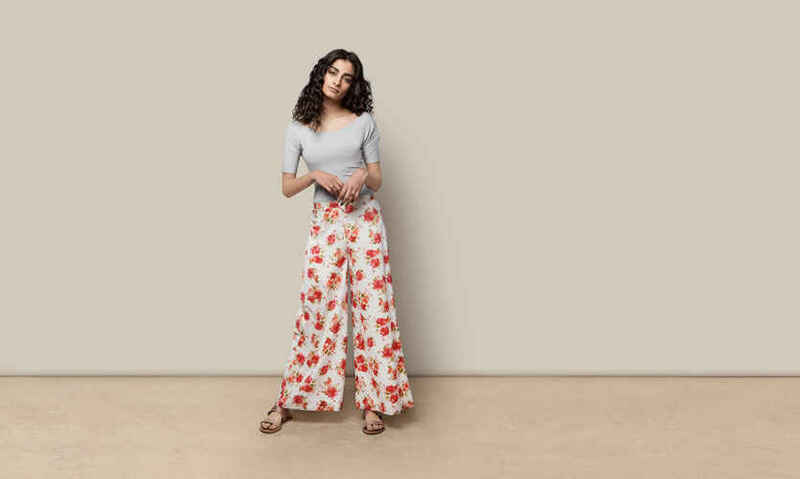 These flowy trousers (or drop crotch pants) are the perfect season essential, crafted for summer lounging. SoDelhi recommends styling them with a pop coloured off-shoulder crop top or an empire line spaghetti and a sun hat for maximum effect. And you thought hoodies were strictly drab winterwear. Well, guess again! We love how hot Nicobar’s innovative summer hoodie looks while exuding a sporty, workout-ready vibe. Win! This romantic cropped jacket can class up any outfit in your closet. Throw it on over a printed shift dress or a tank top and flared maxi skirt for a royal look that demands attention! We are sold. A quintessentially girly piece; brownie points for the soft fabric, ample leg room and pretty floral print! Pair it with a solid kurta or cropped shirt and Osho slippers and you’re good to go. Pristine whites speckled with limes, fuchsias, charcoals and fruity reds create the perfect summer palette at Nicobar; we can almost feel the sand beneath our feet, some of these pieces just make us want to head to the beach! Take your pick.